Wow, I'd forgotten how well designed Sectaurs figures were! I'm a little surprised there isn't more of a call for a Sectaurs revival. I suppose they were a pretty minor franchise, though. If childhood memories are stored somewhere in an area of the mind, dammed away in a darkened corner of nostalgia, sometimes all it takes to push that little dutch boy out of the way is an image. I'd mostly forgot about Sectaurs, but at the moment I'm knee deep in sloshy thoughts of furry gloved hands and bug eyed he-man battles over gray skull. I think I only ever had one of the gloves, but it was fun. How that particular action feature was never used again is a bit strange. Fabric's cheap and the articulation comes built in. About 15 years ago, I was at a local yard sale. I was only 11 years old at the time, so I wasn't really in full on collector mode. It was a dreary day, but we stumbled upon a yard sale with old toys from the 1980s. They were GIVING stuff away. Everything ranged in price from ten cents to a dollar. I left with a few vintage Star Wars pieces and M.A.S.K. figures and vehicles, but the seller had the ENTIRE Sectaurs collection, including the Hyve playset. It would have cost no more than $10 for everything, but nah, I wasn't into Sectaurs back then. When one of you invents the time machine, please allow me to go back to 1994 and kick my 11-year-old self square in the balls. I like this, I thought it was a very good custom to begin with. I remember the glove things on the telly now, in the ads. They rocked, and surprisingly still hold up on the cool-o-meter. It's funny that this pic is up, 'cause I'd been entertaining the thought of re-acquiring Sectaurs for some time now. Ebay as of late was slim pickin's at best, and because I'm a stickler for complete figures, (especially with Sectaurs, as that's where they really shine, IMHO) I was forced to play the waiting game. Anyways, I was at the Big Apple Con last weekend, & patience ended up paying off (always does), as I found a dealer who had a MIB Waspax & Wingid, which I purchased for the bartered price of $12. When I got home & busted that baby open, I was quite pleased with having decided to get back into Sectaurs. This line is just great. @Ben: OUCH! That hurts! I'll lend you the time machine when I'm done with it. This isn't quite as gutwrenching, but I still remember going to a yardsale when I was a kid and finding a whole trashbag FILLED with Legos, there had to have been thousands of pieces in there, and they were parts to sets and stuff too. All they wanted was $15 for it, and by the time I begged and pleaded with my mother for it, someone else scooped it up. Once someone completes gets their hands on a time machine would they please go into the future? I need a cloning machine delivered to my house. Looking at this figure, with his golden tresses, determined expression, swanky medallion, and general arm position… I think I'm going to start calling these Sextaurs. Correct me if I'm wrong, but the dude appears to have ball jointed shoulders and hips–that was pretty unusual for an action figure at this scale in 1984. Hell, he looks better than a lot of stuff from the 1990s. 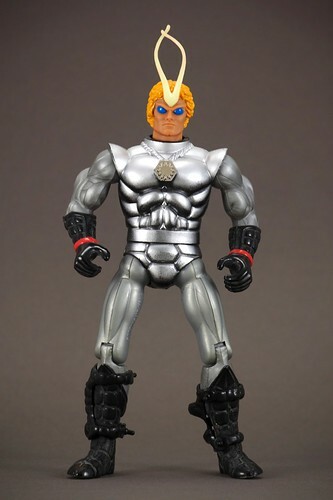 I used to have a knock off Sectaurs figure…think the line was called Galaxy Guardians and Guardian Defenders….basically a new head and weapon very He-Man looking and came with a cool big battery robot with like a horses body…very cool would love to get one again…mine got broke. @Poe: You're absolutely right, & by god, he's far better than most '90's stuff. For that matter, '80's toys in general are overall much better than what the bulk of the '90's had to offer, & I promise that nostalgia has nothing to do with it. The only really annoying articulation thing with Sectaurs was the lack of elbows. I mean, they're far from superarticulated, but they do a decent job in general. I busted out the giant tarantula the other day and scared the crap out of my wife. I'm fairly certain I had a Sectaur when I was a kid. Makes me want to rassle him up. i LOVED this line. i still have the hive playset and a few figures back in storage at my folks place. @Mario: You are so right. 90's toys were pretty crap, with only a few exceptions. Did anyone know they actually made toys based on the Stalone film Demolition Man?….reusing some of the bodies from the New Adventures of He-Man figures. good god ben's story was depressing… not bewcause he missed those sectaurs, i never feel bad when other people miss deals i had to miss too… but he was 11 in 1994. i have toys older than him… that i bought and played w/ when they were brand new! I realise other posters have pointed this out,but this figure is WAY to good for the time period it came out. I love that this Sectaurs guy has 20 comments.